On visiting Comfy Bingo, players are met with a relaxed cartoon character lounging on her sofa with her laptop clearly playing our favourite game; this rather idealistic image is something every player could soon be doing whilst playing at this site. With an enjoyable and relaxing atmosphere, Comfy Bingo gives the impression of being one of the cosiest sites around and once you start playing, you'll soon feel the weight of a busy day evaporate as you enjoy some fun games. Comfy Bingo is powered by the well-known Cozy Games software as part of the Live Bingo Network which will give regular gamers a familiar feel once they start having a look around the site. One of the plus points of Cozy Games sites is that their bingo rooms are extremely simple and straightforward to use, once you've tried one, you've tried them all so even brand new players should have no difficulty getting into the gaming on offer. 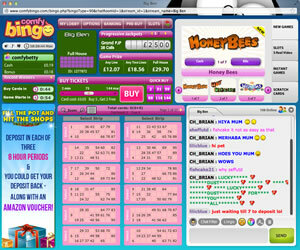 The range of bingo games on offer is also wider than most with 75, 90, 80 and 30 ball speed bingo options to choose from. Comfy Bingo has an extremely informative and well laid out lobby area, which allows players to see exactly what each room has to offer before entering, which makes budgeting for your bingo gaming very straightforward. The lobby shows the names of each room, ticket price, prize money and information regarding progressive jackpots if there is any. All this info means you don't have to mess about going in and out of rooms looking for the right one, as all the details you need are already displayed and this is a huge bonus feature. Comfy Bingo has some generous deposit bonus offers that all players are eligible are for, in fact, every deposit you make comes with a tailored bonus so there's always bonus cash up for grabs. What's more, you can use this bonus money to play slots and side games as well as bingo which is unusual and definitely a plus point. The range of side games on offer is wide and varied, giving players a chance to try out many different types of game and there are monthly promotions specifically for slots and other casino games which are updated regularly. Unfortunately, as is the case with many Cozy Games sites, Comfy Bingo does have unnecessarily high minimum withdrawal and the usual problematic play-through requirements. However, the minimum withdrawal amount was recently lowered from £50 to just £30 making it more acceptable. As a white label the promotions available at the site do seem quite limited if you're looking for anything beyond the wide ranging deposit schemes; which though on the surface these bonus offers seem generous, they do, as you might expect, favour the site rather than the player. One of the huge benefits to joining Comfy Bingo is that they are one of the new breed of sites that offer a mobile application, allowing players with smartphone or tablet access to enjoy their games on the go. Mobile bingo is a growing market area and therefore, Comfy Bingo is certainly ahead of the game in incorporating this into their site. The site also claims there are specific offers for mobile players that can't be claimed online so this is certainly a feature worth checking out. 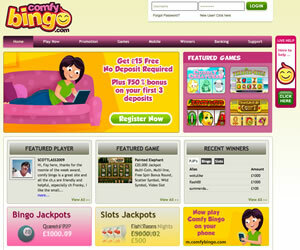 For relaxing bingo gaming in a calm and cosy atmosphere, Comfy Bingo comes up trumps. Comfy Bingo offers 90 ball bingo and two variants of the 75 ball game, the traditional pattern bingo and five-line bingo. 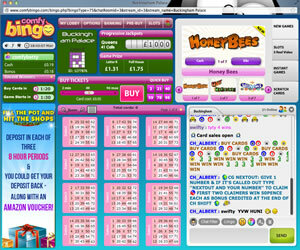 In addition to this there are a selection of instant win games available at the site, some of which are embedded into the same game window as the bingo. Wagering requirements on deposits vary at Comfy Bingo dependent on the option you choose for the bonus - bonus funds or cash. For bingo the wagering requirement if bonus cash accepted is 4x the amount of deposit + bonus received or for any other game besides bingo it is 10x the amount of deposit + bonus received. You should note that you can only request one withdrawal in any given seven day period at Comfy Bingo.